#1. This week's number one is an international forward Evelyn Akhator (190-95, college: Kentucky, currently plays in Turkey). She was the major contributor in Besiktas' victory against the 11th-ranked Adana Basket (8-18) crushing them 111-71 in the Turkish KBSL in Saturday night's game. Akhator had a double-double by scoring 25 points and getting 16 rebounds. She also added 3 assists in 23 minutes on the court; quite an impressive performance considering it's only Akhator's second season in pro basketball. Besiktas CT Istanbul (12-16) is placed fifth in the KBSL. It was her team's first victory after five consecutive loses. They will play only one more game in the Regular Season. And that game will be critical. It's Akhator's first year with the team. She has relatively good stats this season: 15.0ppg, 9.9rpg, 1.6apg, 1.8spg, 2FGP: 58.9%(162-275), 3FGP: 33.3% and FT: 63.2% in 27 games she played so far. Akhator is currently a member of the Nigerian senior national team. #2. Second place goes to an international forward Adaora Elonu (185-90, college: Texas A&M, currently plays in Spain). Elonu led Perfumerias Avenida to an easy victory against the eighth-ranked Mann Filter (10-16) crushing them 79-56 in the Spanish LFB on Sunday night. She scored 12 points and had 3 steals in 20 minutes. Perfumerias Avenida Salamanca (25-1) is placed first in the LFB. It was her team's 25th consecutive victory in a row. It's Elonu's first season with the team. This year Elonu has relatively solid stats: 10.3ppg, 4.3rpg, 2.0apg, 1.6spg, 2FGP: 62.4%(108-173), 3FGP: 41.2% and FT: 77.5% in 28 games. She has a dual citizenship: Nigerian and American. Elonu is in the roster of the Nigerian senior national team. #3. The Nigerian player who performed third best last week abroad was an international guard Ezinne Kalu (173-92, college: SSU, currently plays in Germany). She led Gruner Stern Keltern to a victory over the closely-ranked BC Pharmaserv Marburg (15-5) 75-61 in the German DBBL in Sunday night's game. Kalu was MVP of the game. She recorded 22 points, 3 assists and 3 steals (made all of her seven free throws). It was the game of the round between two top 4 ranked teams. Gruener Stern Keltern (15-5) is placed second in the DBBL. It was her team's eighth consecutive victory in a row. Kalu has reliable stats this season: 13.5ppg, 2.0rpg, 2.8apg, 2.1spg, 2FGP: 52.4%, 3FGP: 33.9% and FT: 77.8%. She is another player who holds two passports: Nigerian and American. Kalu is also a member of the Nigerian senior national team. #4. Forward Sarah Imovbioh (188-92, college: S.Carolina, currently plays in Hungary) could not help PEAC-Pecs (14-8) in their last game. Despite her very good performance PEAC-Pecs lost 78-82 at home to the lower-ranked (#8) Cegledi EKK. Imovbioh was the top scorer with 21 points. She also added 7 rebounds in 32 minutes. Imovbioh has individually a very good year with high stats. She averages: 18.3ppg and 10.3rpg in 24 games. Imovbioh is also Nigerian national team player. #5. Former international forward Uju Ugoka (185-93, agency: Two Points, college: Virginia Tech, currently plays in France) was the main contributor in Roche's victory against the closely-ranked Flammes (13-9) 71-60 in the French LFB on Saturday night. She was the best player in that game. Ugoka scored 16 points and grabbed 4 rebounds. Roche Vendee BC (12-10) is placed sixth in the LFB. It was her team's fourth consecutive victory in a row. Ugoka's stats this season are: 12.7ppg and 6.4rpg. She used to play for the Nigerian national team three years ago. #6. Power forward Ify Ibekwe (187-89, college: Arizona, currently plays in Turkey) was not able to help Kayseri (8-18) in their last game. Despite Ibekwe's very good performance Kayseri lost 68-82 on the road to the much higher-ranked (#3) Hatay. She was the second best scorer with 15 points. Ibekwe also added 8 rebounds in 21 minutes. The Regular Season already ended. Ibekwe has very impressive stats this year: 20.4ppg, 10.1rpg, 3.5apg and 2.1spg in 15 games. She has both American and Nigerian nationalities. Ibekwe is a former international player as she played for the Nigerian senior team three years ago. #7. International forward Cecilia Okoye (185-91, college: McNeese St., currently plays in Luxembourg) was not able to secure a victory for Etzella (22-1) in their game against T71 Dudelange (24-4) in the Luxembourg Total League. Okoye recorded 8 points in 23 minutes. The first-placed Etzella (22-1) was badly defeated 79-63 in Dudelange by the leading T71 Dudelange in the Places 1-6 group. Okoye's stats this year are: 14.0ppg, 8.5rpg and 1.4apg in 14 games. She also holds two passports: Nigerian and American. Okoye is also Nigerian national team player. She used to play for First Bank BC in Nigerian league. #8. An experienced center Aisha Mohammed (191-85, college: Virginia, currently plays in Turkey) contributed to an easy victory against the closely-ranked Istanbulgucu (16-14) crushing them 77-56 in the Turkish TKBL (second division) in Friday night's game. Mohammed recorded a double-double by scoring 22 points and getting 11 rebounds. She also added and 5 steals. Bursa BSB (18-12) is placed seventh in the TKBL. It was her team's fourth consecutive victory in a row. They will play only one more game in the Regular Season. And now that game is very crucial. This season Mohammed has very high stats. She averages: 16.8ppg, 11.1rpg, 1.7apg and 1.8spg. Mohammed holds both American and Nigerian passports. She plays currently for the Nigerian national team. Mohammed used to play for First Bank BC in Nigerian league. #1. Temi Fagbenle (193-F-92, college: USC, currently plays in Poland) led CCC Polkowice to a victory over the closely-ranked Arka Gdynia (17-7) 68-50 in the Polish EBLK last Sunday. She was MVP of the game. Fagbenle scored 19 points, grabbed 8 rebounds and made 2 blocks; not bad, considering it's only her third season in pro basketball. It was the game of the round between two top 4 ranked teams. CCC Polkowice (22-2) is placed first in the EBLK. It was her team's 12th consecutive victory in a row. It's Fagbenle's first year with the team. This season Fagbenle has relatively solid stats: 14.0ppg, 6.9rpg, 1.2apg, 1.3bpg and 1.2spg. She has a dual citizenship: British and Nigerian. #2. Experienced Ejay Ofomata (180-G/F-85, college: Central State, currently plays in United Kingdom) could not help Lions (6-14) in their last game on Saturday. Despite her good performance Lions was crushed 79-58 on the road by the higher-ranked Nottingham Wildcats (#5). Ofomata recorded a double-double by scoring 10 points and getting 12 rebounds. She also added 4 assists. Ofomata's team will play only one more game in the Regular Season. And that game will be critical. Ofomata averaged so far 10.6ppg, 7.3rpg, 1.2apg and 1.6spg. She is another player who holds two passports: Nigerian and British. #1. This week's number one is an international forward Sarah Imovbioh (188-92, college: S.Carolina, currently plays in Hungary). Imovbioh could not help PEAC-Pecs (14-8) in their last game on Sunday. Despite her very good performance PEAC-Pecs was badly defeated 77-58 on the road by the lower-ranked ZTE NKK (#5). Imovbioh recorded a double-double by scoring 23 points and getting 10 rebounds. She also added and 3 steals. Imovbioh has individually a very good season with high stats. She averages: 18.1ppg, 10.7rpg, 2FGP: 66.8%(147-220) and FT: 63.0%. Imovbioh is currently a member of the Nigerian senior national team. #2. Second place goes to an international forward Evelyn Akhator (190-95, college: Kentucky, currently plays in Turkey). She led Besiktas to an easy victory against the closely-ranked Ormanspor (13-13) crushing them 88-66 in the Turkish KBSL on Saturday night. Akhator had a double-double by scoring 12 points and getting 11 rebounds. She also added 3 assists in 28 minutes. Besiktas CT Istanbul (12-16) is placed fifth in the KBSL. They ended the series of five consecutive loses. Akhator's team will play only one more game in the Regular Season. And that game will be critical. Akhator has relatively good stats this year: 14.4ppg, 9.6rpg, 1.6apg, 1.9spg, 2FGP: 56.2%(141-251) and FT: 63.6% in 25 games she played so far. She is in the roster of the Nigerian senior national team. #3. The Nigerian player who performed third best last week abroad was former international power forward Ify Ibekwe (187-89, college: Arizona, currently plays in Turkey). Ibekwe was not able to help Kayseri (8-17) in their last game on Saturday. Despite her very good performance Kayseri was badly defeated 76-58 at home by the leading Fenerbahce. Ibekwe recorded a double-double by scoring 24 points and getting 10 rebounds. She also added 3 assists and 3 steals. Ibekwe's team will play only one more game in the Regular Season. And now that game is very crucial. This season Ibekwe has very high stats. She averages: 20.8ppg, 10.3rpg, 3.7apg, 2.3spg, 2FGP: 55.2%(90-163), 3FGP: 31.9%. Ibekwe has a dual citizenship: Nigerian and American. She played for the Nigerian national team three years ago. #4. Forward Adaora Elonu (185-90, college: Texas A&M, currently plays in Spain) contributed to an easy victory against the eighth-ranked Mann Filter (10-16) crushing them 77-51 in the Spanish LFB last Wednesday. Elonu recorded 6 points, 5 rebounds and 2 blocks in 16 minutes. Perfumerias Avenida Salamanca (25-1) is placed first in the LFB. It was her team's 25th consecutive victory in a row. This year Elonu has relatively solid stats: 10.3ppg, 4.4rpg, 2.1apg and 1.6spg in 27 games. She is another player who holds two passports: Nigerian and American. Elonu is also Nigerian national team player. #5. International forward Atonye Nyingifa (180-90, college: UCLA, currently plays in Spain) was the major contributor in a Maquinaria Ensino's victory against the closely-ranked Al-Qazeres (8-17) 67-55 in the Spanish LFB on Sunday night. She recorded a double-double by scoring 15 points and getting the same number of rebounds. Nyingifa also added 4 assists. Duran Maquinaria Ensino Lugo (4-22) is placed second from the bottom (#13) in the LFB. It was Maquinaria Ensino's first victory after five consecutive loses. The Regular Season already ended. It's Nyingifa's first season with the team. She has reliable stats this year: 13.7ppg, 9.0rpg, 1.8apg and 1.9spg. Nyingifa has both American and Nigerian nationalities. She plays currently for the Nigerian national team. #6. Guard Promise Amukamara (173-93, college: ASU, currently plays in Romania) led Satu Mare to a victory over the second-ranked Cluj Napoca (17-7) crushing them 74-53 in the Romanian Liga Nationala in Tuesday night's game. Amukamara was MVP of the game. She scored 17 points and added 6 assists in 33 minutes. It was the game of the round between two top 3 ranked teams in Group Red. CS Municipal Satu Mare (16-6) is placed second. Amukamara's stats this year are: 14.2ppg, 3.3rpg, 4.6apg and 2.3spg in 23 games. She also holds two passports: Nigerian and American. Amukamara is an international player who is currently on the senior Nigerian National Team roster. #7. Former international forward Uju Ugoka (185-93, agency: Two Points, college: Virginia Tech, currently plays in France) was the main contributor in Roche's victory against the second-ranked Lyon (18-4) 74-60 in the French LFB last Saturday. She was the best player in that game. Ugoka recorded 11 points. Roche Vendee BC (12-10) is placed sixth in the LFB. It was her team's fourth consecutive victory in a row. There are only two games left until the end of the Regular Season. So now every game will be important. Ugoka's stats this season are: 12.5ppg and 6.7rpg. She used to play for the Nigerian national team three years ago. #8. Forward Elo Edeferioka (188-93, college: Georgia Tech, currently plays in Spain) contributed to an easy victory against the 14th-ranked Cerdanyola (0-24) crushing them 71-48 in the Spanish LF2 (second division) on Saturday night. Edeferioka recorded 8 points and grabbed 15 rebounds in 24 minutes. Real Club Celta Zorka Vigo (24-2) is placed first in Group A. It was her team's third consecutive victory in a row. The Regular Season already ended. This year Edeferioka's overall stats are: 10.0ppg and 8.4rpg in 19 games. She plays currently for the Nigerian national team. #9. International forward Cecilia Okoye (185-91, college: McNeese St., currently plays in Luxembourg) contributed to Etzella's victory against the sixth-ranked Musel Pikes (12-15) 71-65 in the Luxembourg Total League on Saturday night. Okoye recorded a double-double by scoring 13 points and getting 15 rebounds. Etzella Ettelbruck (22-1) is placed first in Places 1-6 group. It was her team's fifth consecutive victory in a row. They will play only one more game in the Second Stage. Okoye averaged so far 14.5ppg, 9.0rpg and 1.5apg. She holds both American and Nigerian passports. Okoye is also in the roster of the Nigerian national team. She used to play for First Bank BC in Nigerian league. #10. An experienced center Aisha Mohammed (191-85, college: Virginia, currently plays in Turkey) contributed to an easy victory against the closely-ranked Istanbulgucu (16-14) crushing them 77-56 in the Turkish TKBL (second division) in Friday night's game. Mohammed had a double-double by scoring 22 points and getting 11 rebounds. She also added and 5 steals in 35 minutes. Bursa BSB (18-12) is placed seventh in the TKBL. It was her team's fourth consecutive victory in a row. The Regular Season already ended. Mohammed has very impressive stats this year: 16.8ppg, 11.1rpg, 1.7apg and 1.8spg in 17 games. She holds both American and Nigerian passports. Mohammed is an international player who is currently on the senior Nigerian National Team roster. She used to play for First Bank BC in Nigerian league. #1. Temi Fagbenle (193-F-92, college: USC, currently plays in Poland) was the major contributor in a CCC Polkowice's victory against the eighth-ranked AZS UMCS (11-13) 72-57 in the Polish EBLK in Saturday night's game. She scored 15 points and grabbed 6 rebounds in 30 minutes; quite an impressive performance considering it's only Fagbenle's third season in pro basketball. CCC Polkowice (22-2) is placed first in the EBLK. It was her team's 12th consecutive victory in a row. Fagbenle has relatively good stats this year: 14.2ppg, 6.7rpg, 1.2apg, 1.2bpg and 1.3spg in 26 games she played so far. She has a dual citizenship: British and Nigerian. #2. Experienced Ejay Ofomata (180-G/F-85, college: Central State, currently plays in United Kingdom) could not help Lions (6-13) in their last game on Saturday. Despite Ofomata's very good performance Lions was edged 59-56 on the road by the higher-ranked Newcastle Eagles (#3). She recorded a double-double by scoring 24 points and getting 14 rebounds. Ofomata also added and 3 steals. There are only two games left until the end of the Regular Season. So now every game will be critical. Ofomata averaged so far 10.7ppg, 7.0rpg and 1.7spg. She is another player who holds two passports: Nigerian and British. #3. Pallas Kunaiyi-Akpanah (188-F, currently plays college basketball in the States) was not able to help the Northwestern in their game against the University of Arizona (8-10) in the NCAA Semifinals. Kunaiyi-Akpanah scored only 4 points, had 11 rebounds and made 2 blocks in 30 minutes. The Northwestern lost 42-56 at home to the University of Arizona. The Semifinals already ended in the NCAA. Kunaiyi-Akpanah is one of the most experienced players in a team as it's her fourth year in Northwestern's roster. She averaged so far 10.9ppg, 11.2rpg, 1.2apg, 1.5bpg and 1.8spg in 36 games. #1. This week's number one is an international forward Evelyn Akhator (190-95, college: Kentucky, currently plays in Turkey). She led Besiktas to a victory over the league leader Cukurova (22-2) 92-88 in the Turkish KBSL in Saturday night's game. Akhator was MVP of the game. She scored 24 points and grabbed 7 rebounds in 36 minutes on the court; quite an impressive performance considering it's only Akhator's second season in pro basketball. Besiktas CT Istanbul (11-16) is placed fifth in the KBSL. There are only two games left until the end of the Regular Season. So now every game will be critical. It's Akhator's first year with the team. She has relatively good stats this season: 14.5ppg, 9.5rpg, 1.6apg, 1.9spg, 2FGP: 55.8%(135-242) and FT: 63.6% in 24 games she played so far. Akhator is currently a member of the Nigerian senior national team. #2. Second place goes to an international forward Adaora Elonu (185-90, college: Texas A&M, currently plays in Spain). Elonu contributed to an easy victory against the eighth-ranked Mann Filter (10-15) 77-60 in the Spanish LFB on Saturday night. She recorded 9 points, 6 rebounds, 4 assists and 4 steals in 19 minutes. Perfumerias Avenida Salamanca (24-1) is placed first in the LFB. It was her team's 24th consecutive victory in a row. They will play only one more game in the Regular Season. And now that game is very crucial. This year Elonu has relatively solid stats: 10.7ppg, 4.6rpg, 2.2apg, 1.6spg, 2FGP: 64.1%(98-153), 3FGP: 41.2% and FT: 80.6% in 25 games. She has a dual citizenship: Nigerian and American. Elonu is in the roster of the Nigerian senior national team. #3. The Nigerian player who performed third best last week abroad was an international forward Sarah Imovbioh (188-92, college: S.Carolina, currently plays in Hungary). She was the main contributor in PEAC-Pecs' victory against the closely-ranked NKE-Csata (11-11) 81-75 in the Hungarian A Division in Saturday night's game. Imovbioh was the best player in that game. She recorded a double-double by scoring 23 points and getting 13 rebounds. Imovbioh also added 3 assists (was perfect 7-for-7 from the free throw line). PEAC-Pecs (14-8) is placed fourth in the A Division. Her team will play only one more game in the Regular Season. And now that game is quite important. Imovbioh has individually a very good season with high stats. She averages: 17.9ppg, 10.7rpg, 2FGP: 66.7%(138-207) and FT: 63.5%. Imovbioh is also a member of the Nigerian senior national team. #4. Guard Ezinne Kalu (173-92, college: SSU, currently plays in Germany) was the major contributor in a Gruner Stern Keltern's victory against the 14th-ranked Goettingen (7-18) crushing them 100-52 in the German DBBL last Sunday. She recorded 22 points in 20 minutes. Gruener Stern Keltern (15-5) is placed second in the DBBL. It was her team's eighth consecutive victory in a row. Kalu has reliable stats this year: 13.1ppg, 2.0rpg, 2.5apg and 2.1spg in 15 games. She is another player who holds two passports: Nigerian and American. Kalu is also Nigerian national team player. #5. Former international forward Uju Ugoka (185-93, agency: Two Points, college: Virginia Tech, currently plays in France) contributed to an easy victory against the closely-ranked Bretagne Basket (9-12) crushing them 81-59 in the French LFB on Sunday night. She scored 8 points and grabbed 11 rebounds. Roche Vendee BC (11-10) is placed fifth in the LFB. It was her team's third consecutive victory in a row. They will play only one more game in the Regular Season. Ugoka's stats this season are: 12.6ppg and 6.9rpg. She used to play for the Nigerian national team three years ago. #6. Guard Promise Amukamara (173-93, college: ASU, currently plays in Romania) contributed to an easy victory against the second-ranked Cluj Napoca (16-7) 72-54 in the Romanian Liga Nationala last Friday. Amukamara scored 9 points and added 8 passes. It was the game of the round between two top 3 ranked teams in Group Red. CS Municipal Satu Mare (16-6) is placed second. It's Amukamara's first season with the team. Her stats this year are: 14.0ppg, 3.4rpg, 4.5apg and 2.5spg. Amukamara has both American and Nigerian nationalities. She is an international player who is currently on the senior Nigerian National Team roster. 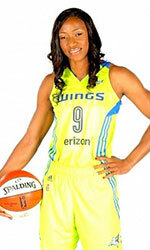 #7. International forward Atonye Nyingifa (180-90, college: UCLA, currently plays in Spain). Nyingifa could not help Maquinaria Ensino (3-22) to beat Valencia (15-10). She cannot count Saturday's game as one of the best ones. Nyingifa recorded only 3 points and grabbed 17 rebounds in 31 minutes. Maquinaria Ensino lost 52-57 on the road to the higher-ranked (#4) Valencia. It was Maquinaria Ensino's fifth consecutive loss in a row. Her team will play only one more game in the Regular Season. Nyingifa averaged so far 13.7ppg, 8.8rpg, 1.7apg and 1.9spg in 25 games. She also holds two passports: Nigerian and American. Nyingifa is also Nigerian national team player. #8. Forward Elo Edeferioka (188-93, college: Georgia Tech, currently plays in Spain) contributed to a Real Celta Vigo's victory against the ninth-ranked Segle XXI (11-13) 66-57 in the Spanish LF2 (second division) last Saturday. She scored 13 points and grabbed 9 rebounds in 25 minutes. Real Club Celta Zorka Vigo (22-2) is placed first in Group A. There are only two games left until the end of the Regular Season. Edeferioka averaged so far 10.1ppg and 8.0rpg in 18 games. She plays currently for the Nigerian national team. #9. An experienced international center Aisha Mohammed (191-85, college: Virginia, currently plays in Turkey) helped Bursa BSB win their game against the 14th-ranked Mersin Uni (7-22) crushing them 77-49 in the Turkish TKBL (second division) in Friday night's game. Mohammed was the top player that evening. She recorded 20 points, 9 rebounds and 3 assists in 27 minutes. Bursa BSB (16-12) is placed seventh in the TKBL. There are only two games left until the end of the Regular Season. Mohammed has very impressive stats this year: 16.7ppg, 11.0rpg, 1.7apg and 1.7spg in 15 games. She holds both American and Nigerian passports. Mohammed is also in the roster of the Nigerian national team. She used to play for First Bank BC in Nigerian league. #1. Temi Fagbenle (193-F-92, college: USC, currently plays in Poland) led CCC Polkowice to a victory over the closely-ranked Artego Bydgoszcz (18-6) 61-44 in the Polish EBLK last Saturday. She was the best player in that game. Fagbenle scored 14 points, grabbed 8 rebounds and made 2 blocks; not bad, considering it's only her third season in pro basketball. It was the game of the round between two top 4 ranked teams. CCC Polkowice (22-2) is placed first in the EBLK. It was her team's 12th consecutive victory in a row. They will play only one more game in the Regular Season. And that game will be critical. It's Fagbenle's first year with the team. This season Fagbenle has relatively solid stats: 14.2ppg, 6.8rpg, 1.2apg, 1.2bpg and 1.3spg. She has a dual citizenship: British and Nigerian. #2. Jessica Ogunnorin (185-F-92, college: VCU, currently plays in Spain) contributed to an easy victory against the leader Ardoi (21-2) 66-47 in the Spanish LF2 (second division) in Saturday night's game. Ogunnorin had a double-double by scoring 11 points and getting 12 rebounds in 25 minutes. GDKO Bizkaia Ibaizabal Galdakao (13-11) is placed sixth in Group A. It was her team's third consecutive victory in a row. There are only two games left until the end of the Regular Season. This year Ogunnorin's overall stats are: 9.2ppg and 11.7rpg in 10 games she played so far. She is another player who holds two passports: Greek and Nigerian. #3. Pallas Kunaiyi-Akpanah (188-F, currently plays college basketball in the States) contributed to Northwestern's surprising victory against the James Madison University (17-1) 74-69 in the NCAA Quarter-Finals in Wednesday night's game. She recorded a double-double by scoring 11 points and getting the same number of rebounds. The Northwestern University has not so impressive 4-16 conference record this season. Kunaiyi-Akpanah is one of the most experienced players in a team as it's her fourth year in Northwestern's roster. Kunaiyi-Akpanah averaged so far 11.1ppg, 11.2rpg, 1.2apg, 1.5bpg and 1.8spg. #4. Experienced Ejay Ofomata (180-G/F-85, college: Central State, currently plays in United Kingdom). Ofomata could not help Lions (6-12) to beat Mystics (2-24). She recorded 6 points and grabbed 8 rebounds. Lions was defeated 65-54 on the road by the lower-ranked Mystics (#14). There are only three games left until the end of the Regular Season. Ofomata's overall stats this season are: 9.7ppg, 6.5rpg, 1.1apg and 1.6spg. She has both Nigerian and British nationalities.